Gouroms are the tunnel digging warriors of Sverige. It is not uncommon to find a gourom in the midst of digging a tunnel or just digging, in general. In game terms, this means that gourom are a warrior class species, as described on the classes wiki page. While most gourom come from underground colonies, it is not unheard of for goroums to have formed or joined packs above ground as well. Gouroms are the hardiest species in Sverige. They have thick, tough skin and coats. Their bodies are built for tunneling, but their heavily-muscled bodies make them skilled at other activities as well. Gouroms can adapt to nearly any environment, except extreme heat conditions. Generations of digging have given them large, spade-like paws. They have developed overlarge eyes from all the time spent underground, and have also grown large, thick, rounded ears. They have developed rather short snouts, and a small mid-section. Like most things about the gourom, their tails are shorter than average as well. Their legs are similarly short, but very thick and powerful. There is no size or shape difference between male and female gouroms. Gouroms are 30 inches tall at the most, but most tend to be around 26 inches. The smallest gouroms will be 20 inches tall once they reach adulthood, when not afflicted with a mutation such as 'dwarf' or 'giant.' They weigh as much as 150 pounds, and as little as 100 pounds. A chart of colors a gourom can naturally be. They can come in lighter colors, but you will have to purchase a mutation for them. Gouroms are covered in dark shaggy fur. This fur is very wiry and not soft to the touch. They can be any color, just on the darker end of the spectrum. They are often either very simple in appearance or very complex, depending on the region which they come from. A gourom's most sensitive sense is their hearing. Rather than hearing things from afar, they specialize in pinpointing the faintest sounds in the area around them. When underground, they can listen for structural weaknesses and nearby prey. They have a sensitive nose as well, for much the same reason. It is not uncommon for gouroms to have the 'heat sensing' mutation. They are known to form very strong bonds with other individuals. They do not necessarily have to be with another Gourom, though this bond will not form nearly as quickly as it will with another Gourom. All Gourom have a strong sense of family and togetherness; Gourom often form very large groups because of this. Gourom are very invested in their work- whatever it may be, but digging and tunneling is their favorite. They enjoy finding personal treasures, though some of them are extremely greedy and possessive. The gestation period for a gourom is 45 days (one in character season). They have 3 puppies at the most, and breed all year round. More omnivorous than most wolves, Gourom will eat night crawlers and other grubs, rodents and just about any burrowing creature, roots and tubers, and berries. Do you need a reference sheet? 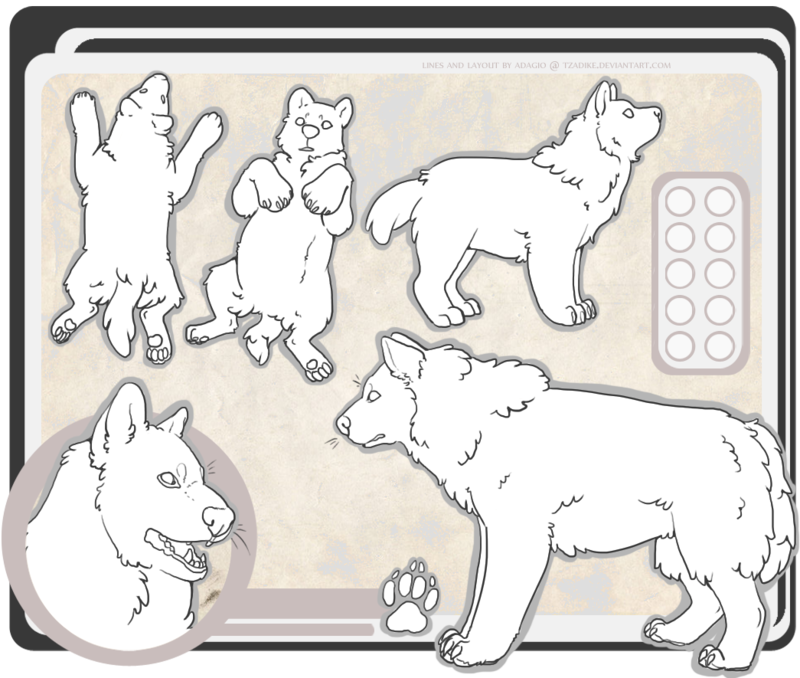 If you can edit PSD files, then feel free to download this reference sheet. If you do not have Photoshop, you can use this PNG file instead.